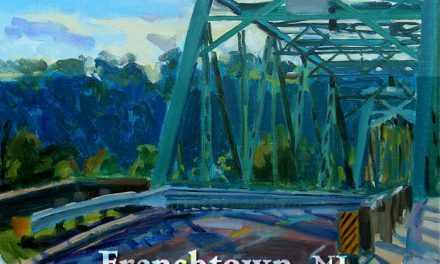 Frenchtown’s Riverfest will celebrate the arts on Sunday, Sept. 3, from 10 a.m. until dusk. Bridge Street will be closed to vehicular traffic, noon-6 p.m., and local musicians will perform in two venues – in the middle of Bridge Street and in Sunbeam Park beside the Delaware River. At 10:30 a giant egg at ArtYard’s Old Hatchery Building at the corner of Lott and Front Streets, former site of Kerr’s Chickeries, will crack open and performers in bird costumes will emerge. All day, visitors will be invited to make paper boats in a riverside tent. As each batch of boats is completed, Vikings in full regalia, led by Eric Fiorito, will take the boats into the river for races. A photo exhibit and contest, “Summer on the Delaware,” can be viewed in the Brokaw Photographic Studio at 34 Bridge St. The contest, sponsored by New Hope Photo and Brokaw Studio, has a $250 purse. Photos will feature Delaware River scenes that were shot this summer. John Schmidtberger of SFA Gallery has invited fellow painters to set up their easels around town; Skye Van Saun will be at the Book Garden (28 Bridge St.) to create personalized poetry on demand; and at The Spinnery (33 Race St.) yarn-dyeing using natural colors will be demonstrated, 2-5 p.m.
Rick Epstein, former editor of the Hunterdon County Democrat and Frenchtown’s Delaware Valley News, will conduct historical walking tours at noon, 2 and 4 p.m. No registration is needed; just meet in front of the Book Garden, 28 Bridge St. The price is $10. Performers on the Bridge Street stage will include the Saddletones (country swing), the Wallace Brothers (country), bluesman Alex Wolfson, Sara’s Jazz Band, and Baby Finster (rock band). Enlivening Sunbeam Park will be Native American drumming, an Eyes of the Wild display of wild animals, Lolly Hopwood singing children’s songs, Keith and Laura Strunk reading stories for children, singer/songwriters Nate Walker, Brian Fitz and Joe Cocco, and the Folkenpunk Trio (bluegrass). 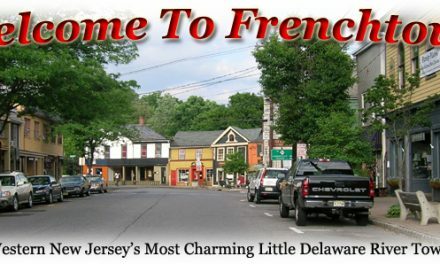 The offerings of Frenchtown’s restaurants will be augmented outdoors by the Lions Club and American Legion’s grills, and the efforts of Smokerhead BBQ, the Bridge Cafe’s pop-up restaurateur Graham Miller, Pirate Cupcake of Milford, Tyler’s Water Ice and Early Bird’s lemonade stand. Vendors and exhibitors will abound, with offerings including green products; information on protecting the environment; artisanal soaps, fishing lures and knives; and paintings, photos and objets d’art. Visitors are invited to register to vote, see Native American artwork, learn about water safety, and undergo henna adornment. During Riverfest the Bridge Cafe will offer bánh mì (Vietnamese bread) sandwiches and homemade ice cream sandwiches; Freedom Art will feature the works of new local artists Jim Colliert and Ryan Brooks Leslie; Olive with a Twist will offer a sampling of 45 different balsamics and olive oils, locally made marmalades, jams, and cheeses, along with artisan breads from the Wayfare Bakers; Country Chic Boutique will hold a 70 percent-off clearance sale; and River Gypsy will discount its new autumn inventory by 15 percent. Additional parking is available at Kathee’s General Store, at Frenchtown school, in the lot at Old Frenchtown Field, and at Artie’s Bar & Grill at 1121 Route 12 (GPS address: Frenchtown). Shuttle service will be available from Artie’s. Bike-check service will be available behind the Bridge Cafe. Photo: Frenchtown Riverfest paper-boat race attendants, shown in this 2015 photo by Bill Brokaw, add Nordic flair to the occasion. Their leader, Eric Fiorito, is in the foreground.